The history of this fabled site spans 150 years, beginning in the mid-1800s when the original building stood alone on the edge of the Pacific. The next incarnation, built by the visionary Adolph Sutro, was a gingerbread castle that attracted Sarah Bernhardt, Buffalo Bill, and other celebrities of the day. Sutro's structure withstood the earthquake of 1906 but was razed by fire in 1907. Rebuilt in 1909, the decades that followed saw the Cliff House go in and out of fashion with the public. Today, the Cliff House has undergone yet another renaissance, boasting two popular restaurants. Straight from the kitchen of a fun, fabulous Jewish mom and her daughter, Jewish Cooking Boot Camp is a guide to whipping up traditional favorites for a new generation. Handed down over the decades, these recipes and tips will take even the most kitchen-challenged gal (or guy) confidently through the Jewish holidays and other important occasions (such as inviting a significant other�s mother for dinner!). Setting out from basic training, it goes on to cover Shabbat, Rosh Hashanah, Chanukah, Yom Kippur, Passover, and other holidays, and includes special chapters on take-along foods and comfort foods. Second title in the Culinary Institute of Ameria Dining Series, A Tavola! explores traditional Italian home cooking. Did you know that dishes we consider Italian like Chicken Parmigiana were actually developed here in the USA? The authors share stories of growing up in Italy and the foods and wines they enjoyed 'a tavola' (at the table). Compete with 89 treasured recipes and 50 full color photos, A Tavola is sure to make everyone want to spend more time at the table. When Michelle Maisto meets Rich�like her, a closet writer with a fierce love of books and good food�their single-mindedness at the table draws them together, and meals become a stage for their long courtship. Finally engaged, they move in together, but sitting down to shared meals each night�while working at careers, trying to write, and falling into the routines that come to define a home�soon feels like something far different from their first dinner together. Part travel guide, part cookbook, A Taste of Heaven is a delightful survey of the fine food and drink made by Catholic religious orders in America, Belgium, France, and Germany. From positively scrumptious beer and cheese to some of the richest chocolate on earth, the treats presented in this book are heavenly indeed, and author Madeline Scherb beautifully captures the heart and spirit of the holy work that goes into producing them. Anna Thomas�s Vegetarian Epicure cookbooks have sold millions of copies and inspired generations. Now she describes her love affair with the ultimate comfort food. �From my kitchen to yours,� Thomas says, �here are the best soups I�ve ever made.� Her wonderfully creative recipes make use of fresh, seasonal produce�try black bean and squash soup in the fall, smoky eggplant soup in midsummer, or seductively perfumed wild mushroom soup for Christmas. Silky puree or rib-sticking chowder�each recipe has room for variation, and nearly all are vegan-friendly. A Guide to Waterless, Greaseless Cooking. Basic cookware care, cooking instructions, nutrition basics, understanding food labels, and the calorie point system. International recipes with detailed instruction and nutritional breakdowns. Knowing what to feed children is one thing. Getting them to eat it is quite another! In Food Fights, 2nd edition, the authors tastefully blend the science of nutrition and pediatrics with the practical insights of parents who have been in your shoes―offering simple solutions for your daily nutritional challenges. 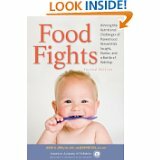 Whether you've got an infant, toddler, or young child, Food Fights promises entertaining, reality-based advice. Acclaimed cultural historian Josh Ozersky defines the American Dream as being able to transcend your roots and create yourself as you see fit. Harland Sanders did exactly that. Forced at age ten to go to work to help support his widowed mother and sisters, he failed at job after job until he went into business for himself as a gas station/caf�/motel owner and finally achieved a comfortable, middle-class life. But then the interstate bypassed his business and, at sixty-five, Sanders went broke again. Packing his car with a pressure cooker and his secret blend of eleven herbs and spices, he began peddling the recipe for "Colonel Sanders' Kentucky Fried Chicken" to small-town diners in exchange for a nickel for each chicken they sold. Ozersky traces the rise of Kentucky Fried Chicken from this unlikely beginning, telling the dramatic story of Sanders' self-transformation into "The Colonel," his truculent relationship with KFC management as their often-disregarded goodwill ambassador, and his equally turbulent afterlife as the world's most recognizable commercial icon. In Food Photography: From Snapshots to Great Shots, photographer Nicole Young dishes up the basics on getting the right camera equipment�lights, lenses, reflectors, etc.�and takes you through the key photographic principles of aperture, ISO, and shutter speed. She then discusses lighting and composition and shows how to style food using props, fabrics, and tabletops. Finally, she explains how to improve your photos through sharpening, color enhancement, and other editing techniques. 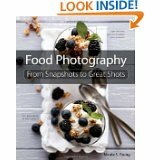 Beautifully illustrated with large, vibrant photos, this book offers the practical advice and expert shooting tips you need to get the food images you want every time you pick up your camera.